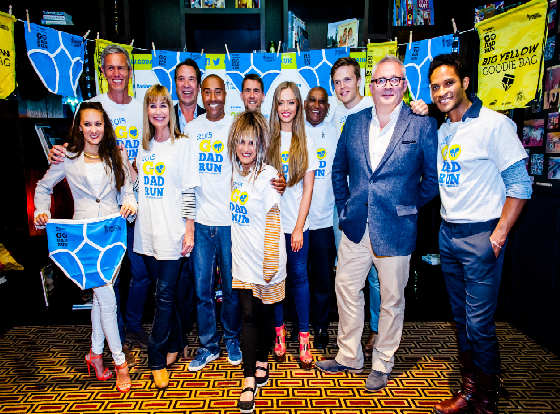 Former World, European and Commonwealth 110m hurdles champion and Olympic silver medalist Colin Jackson was joined by many famous friends this evening at the Malmaison Hotel in Charterhouse Square, London when he launched his 3rd annual Sanlam Go Dad Run 5K’s for men and boys. This year the Cardiff Go Dad Run 5K for men and boys aged 11+ returns to Bute Park, and is one of six that will be held around the UK during the month. The event is a fundraiser for Go Dad Run’s official charity partner, Prostate Cancer UK. At the launch tonight Colin was joined by a wide range of friends and supporters of Go Dad Run including 6 time world swimming champion Mark Foster, TV presenters Sian Lloyd and Diana Bunici, former Arsenal and England goalkeeper David Seaman and his wife, ice skater Frankie Poultney, iconic fashion designer Elizabeth Emanuel, former World and Olympic Triple Jump champion Jonathan Edwards, Olympic silver medalist diver Leon Taylor, singer Dan Olsen, Manoj Shah from the cast of the Sky series Desi Rascals and Royal Ballet soloist Fernando Montano. Entry fees are £15 for adults and £10 for 11-17 year olds and all runners get a pair of the lighthearted Sanlam Blue Yfronts and a PUMA tshirt when they arrive on the day, and then when they cross the finish line they are handed a medal and a Big Yellow Goodie Bag, which is also a small sportsbag. The first three finishers will also win a Timex Ironman watch. Colin is the founder of the Sanlam Go Dad Run and he created it in 2013 to raise awareness of men’s health issues and funds for our charity partner, Prostate Cancer UK. Colin came up with the idea after two of his uncles developed prostate cancer and, sadly, only one survived and when he was researching the subject he was shocked to discover that 1 in 8 men in the UK will develop prostate cancer and that rises to 1 in 4 men of a black African/Caribbean background. Inspired by the extraordinary success of Race For Life he organised his own pilot event in 2013, expanded that to 3 runs last year and is staging 6 this June. The ambition is to at least double that next year and spread the project out across the UK. Our first Sanlam Go Dad Run 5K this year is in Anglesey on June 7th and they then take place in Worcester (June 14), Warrington (June 14), Bristol (June 18) before the two flagship events on Father’s Day June 21, in Bute Park, Cardiff and Southwark Park, London. Colin saw Go Dad Run as a great opportunity to get dads and sons, brothers and uncles, friends and neighbours, all together to do something fun and healthy on Father’s Day or during the build up – but we also need all the mums, daughters and sisters to get behind the men and support them on the day! Sian Lloyd will be in Bute Park to start the race alongside Jamie Baulch, who is one of the official organisers of this year’s run. Go Dad Run’s headline sponsor is Sanlam UK and their supporting sponsors are Big Yellow Self Storage and PUMA. Prostate cancer is the most common cancer in men. More than 10,000 men die every year from this male-only disease, and 300,000 men are living with prostate cancer in the UK. In the UK about 1 in 8 men will get prostate cancer at some point in their lives. When 8 men are in the start lanes on an athletics track or a swimming pool, 1 of them is likely to get prostate cancer. You are two and a half times more likely to get prostate cancer if your father or brother have been diagnosed with it. There are no straightforward tests. Men over the age of 50 are entitled to a PSA blood test that can be an indicator, and there is an online test, but the charity want to develop a risk calculator.